Why they have decided to call a family meeting discussing certain issues. 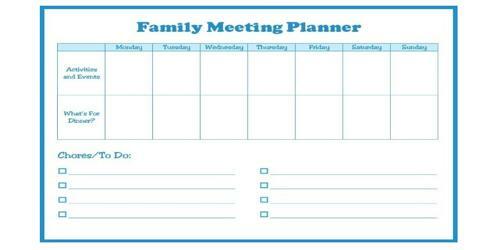 Whether the family meeting also needs to include the kids, adults, teenagers and elderly members of the family. Whether the issues for the discussion are urgent or can be postponed to a later date. Is there a need for every member of the family to become involved in the meeting? [Subject: Discussion Between Family Members On [Subject] After Dinner At [Time of the Meeting]. 1) Introductions — who we are and what is our role in supporting the family. 2) Confirm the details of the family. 3) Purpose of the meeting and the process which could be either to create an action plan or review one which has already been created. 4) Outline the needs and the strengths of the outcomes the assessor would like to witness along with the family. 5) Review of process and goals. 6) Updates on any actions or work which is already ongoing including the actions which are benefiting the family. 7) The steps that need to be taken henceforth to move the family forward. The member needs to work with the family to prioritize the steps and thereafter prepare an action plan. 8) Agreeing on the actions and developing a support plan with a summary of the outcomes desired. 9) Assign and confirm the leader for the action plan. 10) Fresh date needs to be set along with a method for review of the action plan. The meeting should be completed within a span of around 60 minutes. Introduction and objectives of the meeting — review objectives, meeting agreements and the agenda. Item A — discussion and decisions on the teenagers concerned. Item B — discussion with the teenagers invited to the meeting. Item C — informational discussions and decision-making if any. Review items for action — define and record all actionable items as well as the date for the next meeting and the roles assigned to every individual. Adjournment — adjournment of a family meeting must always include appreciations as well as family rituals to conclude on an amicable note.